Manhattan is home to a unique blend of cultural backgrounds, including Bavarian. You don't need Germanic roots to celebrate Oktoberfest, though. From mid-September to October 14th, residents from any of the NYC apartments for rent can take part in this wild celebration. If you're wondering where the action is at, then look no further. These locations are serving up the best brews and the most delicious grub on the island. Nothing says Oktoberfest quite like a pig roast, brass bands, and beer steins. That's exactly what you'll find at Radegast Hall from 11 a.m. to 2 a.m up until September 29th. Late night DJs will keep the party going after dark at this otherwise traditional biergarten. Don't forget to enter the stein-holding contest where you can attempt to hold a 1-liter stein of beer in front of your body. It's tougher than it sounds. Also known as the Oktoberfest Tent, Munich on the East River is entering its fifth year in Manhattan. Pretzels, bratwurst, and pork shank are all on the menu this year, as well as numerous German beers. There will even be Zum Schneider (the restaurant behind this party) exclusives. Traditional music will be played throughout the evenings from September 28th to the 30th and October 3rd through the 7th. Outside the tent, you'll find several gingerbread and roasted almond vendors to round out your Oktoberfest experience. It shouldn't come as a surprise that the Coney Island boardwalk is jumping in on the action. For $25, you gain admission with five beers waiting for you. Pay $40, and your admission comes with a select craft brews, ciders on tap, and a full tasting of 12 German beers. There's plenty of traditional eats to go around from bratwurst to schnitzel, but you can still find funnel cakes and fries like any other Coney Island event. Take your shot at jumbo beer pong, dance to live music, or toss a few rounds of corn hole while you're here. Located on Pier 66, the Frying Pan features festivities out on the water. Well, right off of the pier on a boat at least. Admission, one free beer, and a souvenir mug that gives you access to discounted beer are all included for just $20. Strudel and schnitzel are in abundance. For the price of $60 you can take part in a ten-hour bar crawl featuring one twelve ounce German beer at every bar you enter. Drinking songs, laughter, and a little harmless debauchery are all guaranteed. By the end of the night, you'll swear you were in Munich. Do you love cabbage? If so, then this take on Oktoberfest features dishes just for you. While traditional German sauerkraut is served, there's also a variety of pickled cabbage dishes from other areas in the world. This is also a fundraising event for the Voelker Orth Museum, a bird sanctuary and garden. While this isn't a black tie affair, you'll want to dress your best. The high-class party features live music, tasteful drinks, and ends at 8:30. If you're interested, then this event takes place on September 29th. Hosted by Bronx Brewery, this non-traditional Oktoberfest celebration features the company's take on Berliner Weisse as well as live music and DJs. Food trucks are available to satisfy your appetite, and the first 150 tickets sold come with a limited-edition stein. This is the FiDi neighborhood's take on the Munich tradition, held at Pier 15. 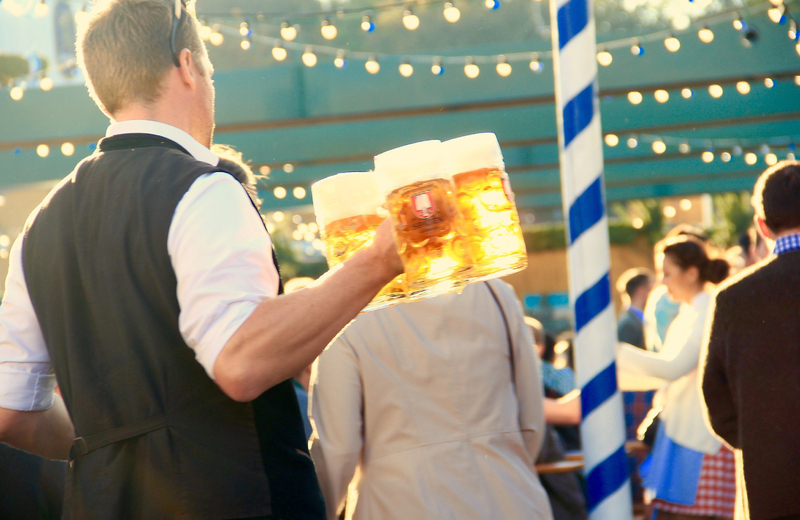 You'll find all of the classic German beers from Radeberger to Hofbrau and food galore. The party runs on a ticket system, with each ticket costing $10. It takes two to fill up a large beer stein, but that's a lot of beer. You can save $50 by purchasing the friend's package for $500, which comes with three large steins and 55 tickets. Arts and crafts, live music by the Polka Brothers, and a virtual apple picking experience are just some of the highlights at DUMBO's Oktoberfest. Patrons can also take part in a social media contest or sit around and enjoy adult coloring books. Sunday afternoon (October 6th) features a children-friendly crafts fair as well. It's a unique way to celebrate the holiday. One of the best parts about living in the city is being able to reach any part of the island with the various public transportation options, then head back home when the fun is over. From 15 Cliff, you're minutes away from eight subway lines ready to whisk you away to Oktoberfest delight. These luxury apartments feature spacious layouts, top-tier finishes, and community spaces with amenities that cater to your every need. A landscaped roof deck offers stunning views of the city skyline, a resident lounge helps you relax after a long day, and the fitness center keeps you looking your best. The CitiBike docking station makes it easy to ride your bike to work or any of the world-class entertainment found on the lower end of the island. Pet-friendly and fee-free, the community is unlike any other in FiDi. Each home is fully furnished with the finest in modern comforts. Barnwood-style plank flooring leads to solar shade treated windows that offer expansive views of the city. Woodgrain custom cabinetry and white quartz countertops accentuate stainless steel appliances in the kitchen. Kohler brushed nickel fixtures mingle with porcelain wall tile in the bathroom. A Bosch washer and dryer ensures you'll never deal with the hassle of community laundry, while overhead recessed lighting provides the perfect mood for the breakfast bar in your kitchen or a movie on Netflix with free WiFi. 15 Cliff is more than just another city address, it redefines life in Manhattan. We invite you to experience a new level of luxury here in New York City, one where the comforts of home and the thrills of the city are at your fingertips. Welcome to elevated living. Welcome to 15 Cliff.